Lash Extensions have become the most in-demand treatment of 2018! Our blog this week focuses on staying lashes above the competition with best practice from our Pro team of Beauty Tutors from across our 9 training centres. Don’t forget our Eyelash Extension course is fully accredited by ABT so you can be sure you are completing the best quality training course within this popular and lucrative treatment! Always keep your lash adhesive at the temperature indicated by the manufacturer to ensure optimal results and drying time for your glue. Also ensure you store your adhesive within a vacuum container to ensure the longevity of your lash glue. Use a good quality adhesive – we highly recommend LashBase No. 1 Extreme adhesive which has an incredible 1-2 second drying time. This means you can work more quickly, effectively, provide a longer lasting bond and fit in more clients therefore earn more money! Excellent lighting is essential! Glamcor lash lights are the best in the industry and will have a dramatic effect on your work. Not only is this important to avoid straining your eyesight, but also allows you to work accurately and effectively to deliver incredible lash results ensuring each lash bonds exactly as and where it should. Speed up your treatment process by using the right tools for the job – individual lashes on strips, glue rings and ultra sharp, good quality tweezers. Do not coat the lashes in glue! Dip in only 2mm at the base of the false lash to ensure they remain soft, natural and fluffy – and not become rigid from being coated in adhesive! Prep! This is absolutely vital to ensuring a highly quality lash extension result. Use an oil free eye make up remover to remove all traces of eye make up before starting your application. Use a foaming lash cleanser to clean and remove bacteria. Next ensure you prime the lashes to dehydrate the lashes using Isopropyl alcohol (IPA). IPA is pure alcohol, it comes in different percentages. You want one thats at least 91%. Ready to use Lash primers tend to have some alcohol content in them, ethanol or ipa but many lash technicians just purchase a straightforward IPA product. It’s the alcohol that removes the natural oils leaving the lashes ready for perfect bonding and guarantees great retention and longevity of the lashes. Always graduate the lashes naturally from inner to outer corner of the eyes ensuring the weight and length of the lash is suitable for the natural lash to support it. Incredibly long lashes can be wonderful but if the client’s natural lashes are thin, short or damaged in any way then the lash extensions will not bond or sit right and therefore will not last as they should. Graduation ensures a quality result that has maximum impact! Magnifying glasses! They may not look glamorous but they vastly improve the quality of work both through better separation and isolation of the natural lash. Used together with good lighting, they create perfect work! The quality of your lashes is fundamental to the results you will achieve. A beautiful lightweight ultra soft, ultra natural quality lash should always be used. Ensure you have a good selection of lash curves, lengths and thicknesses to ensure you are able to best match the lash selected to the suitability of the client’s natural lashes but also the look they wish to achieve without having to compromise on the lashes you have available to use. 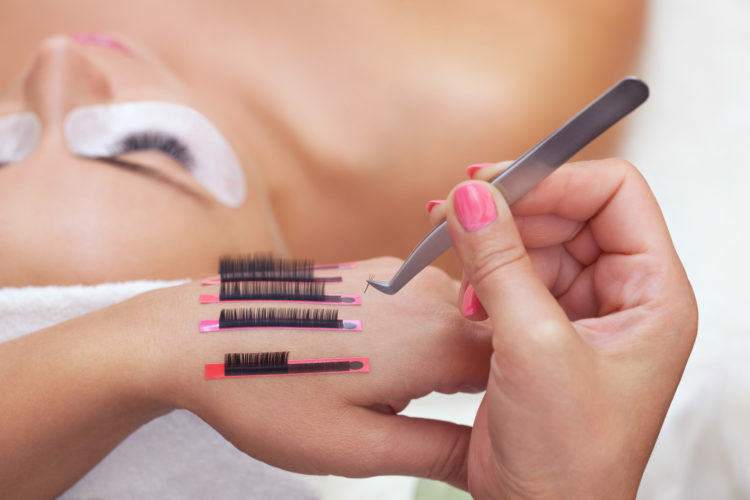 Discover our incredible Fast Track, Fully Accredited Eyelash Extension training courses and start earning up to £50 an hour with these amazing treatments that will have your clients coming back for more and new clients through continuous word of mouth recommendations! With the top tips above and our quality training courses, backed up with our in-house Support team available to assist you beyond your studies, you can be sure to get ahead of the competition!